We were blessed with a number of really warm days during February. Sunny days in the 60s, and even the 70s. Daffodils bloomed; trees began to bud. An early taste of spring. Eager to shake a bad case of cabin fever, I found myself supplementing my customary woodsy walks at a local park with frequent jaunts to Tyler Arboretum. One very warm day, I discovered that the frogs had come out to play. Spring peepers were secretive as always, impossible to see and impossible not to hear. And the wood frogs! Dozens of wood frogs. I’d never seen so many. They were out of hibernation, looking for love, and finding it. Shortly thereafter, the pond was full of frogspawn. And why do I only have cell phone images of the wood frogs? I blame a lack of vision. Not the creative kind of vision. Literal vision – my eye sight. I’ve been battling rapidly worsening cataracts in both eyes for some time. Cataracts are easily corrected by surgery, but the process has taken far longer than I expected. In the meantime, my impaired vision has dampened my enthusiasm for photography and limited my driving to a handful of nearby locales. Most of the time, lacking all confidence, I haven’t even bothered to take my camera. Inevitably, I’ve found something neat that begged for a photograph, and I’ve had to resort to my cell phone. That’s been great for my Facebook page, not so much for the Wild Edge. So the next very warm day, I went to Tyler, with a real camera, specifically looking for frogs. Of course, there were no frogs, but I found other subjects to shoot. 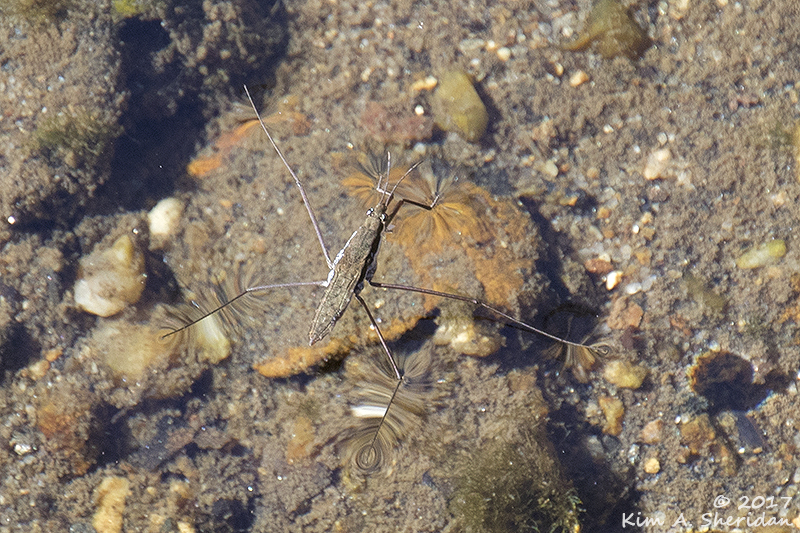 The bridge across Dismal Run offered a unique view of a water strider skimming along the surface. 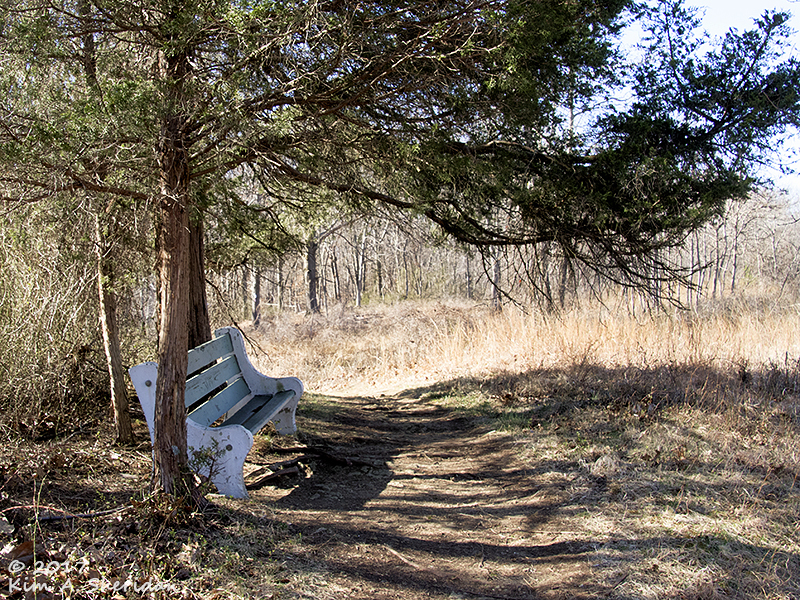 This is one of my favorite spots, a bench under eastern red cedar trees at the top of Pink Hill. After climbing the trail up from Dismal Run, a nice shady place to rest and cool off is welcome. One warm Saturday, Robb, Don and I found ourselves in a bit of a hot spot. The day was sunny and blessedly free of other commitments. So we went to the Pine Barrens, in search of green trees. 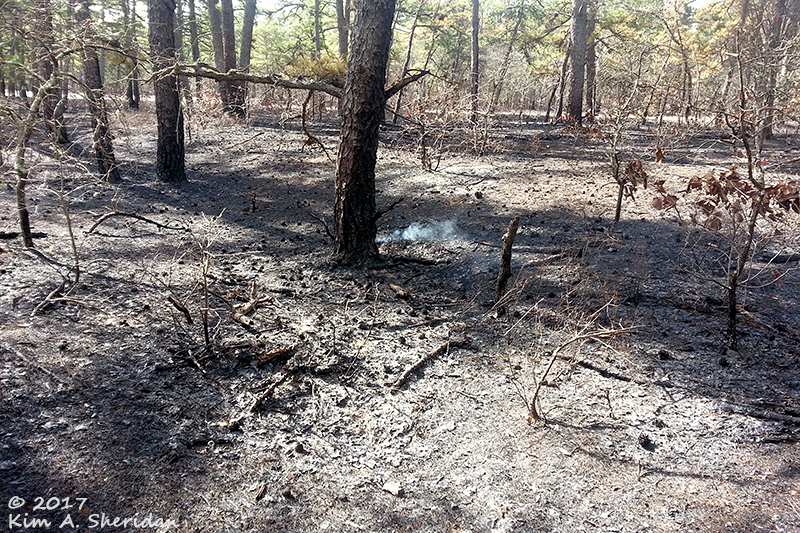 We weren’t expecting to find our chosen trail flanked by the site of a recent controlled burn. A very recent controlled burn. So recent, in fact, that there were quite a few plumes of smoke where the fire still smoldered. 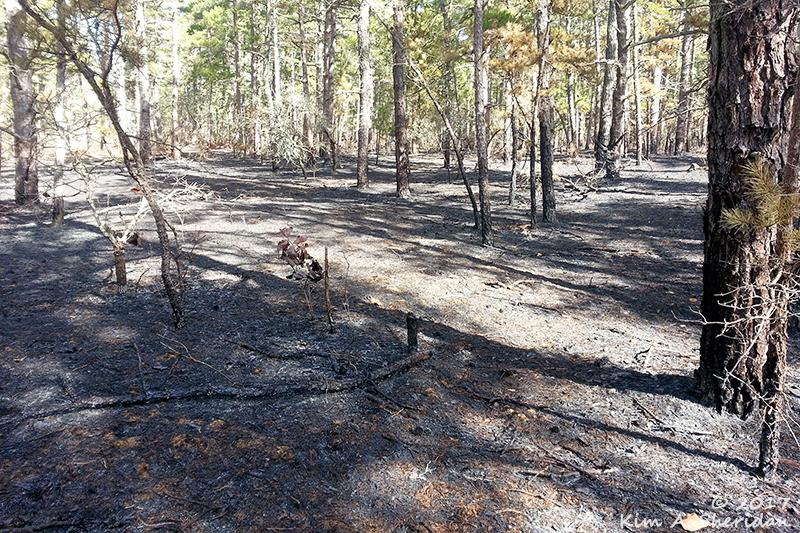 Controlled burns are conducted in the Pinelands to clear the forest floor of deep layers of pine needles and other brush. If left in place, this duff could fuel disastrous wildfires. 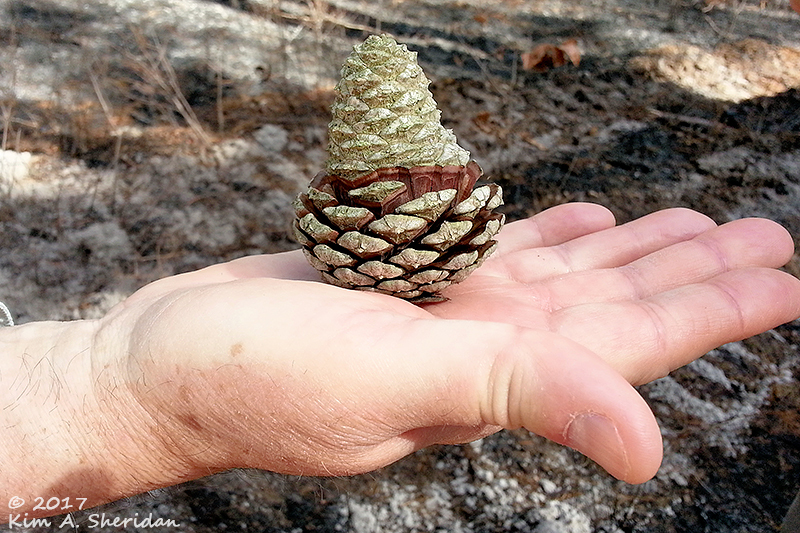 Burns like this help the pine trees, too. 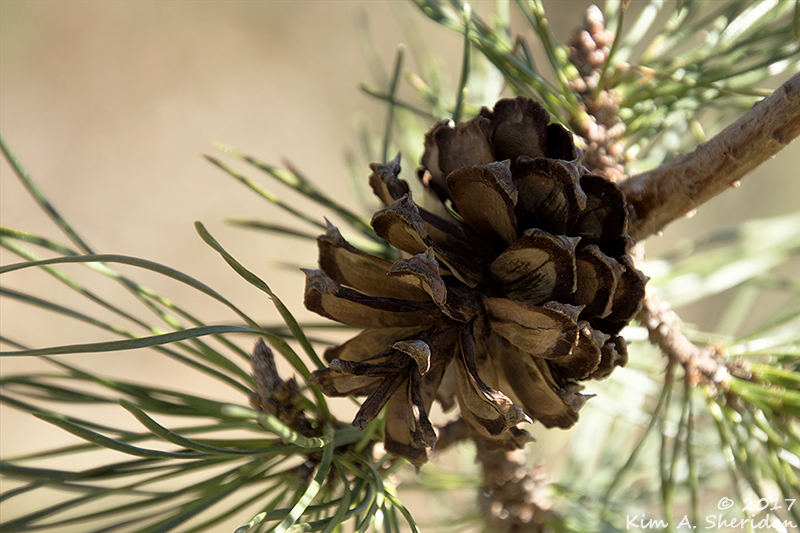 Pitch pine cones are serotinous. They require fire with temperatures above 108° to open and release their seeds. This strange cone got the job half done. 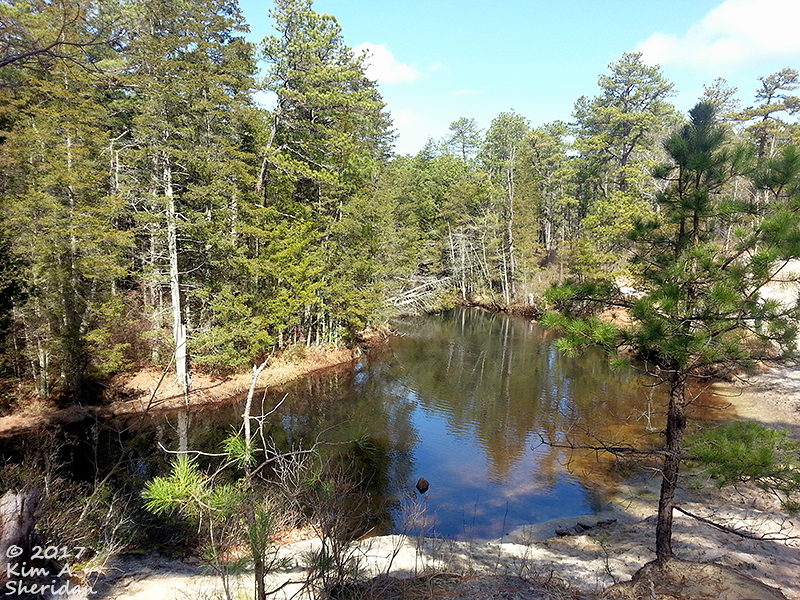 One of my favorite views in the Pine Barrens. White sand, tea-colored water, green trees, blue sky. Serenity on the Oswego River. The calendar turned from fevered February to March madness, and suddenly winter returned. Don’t let the deep blue sky fool you. 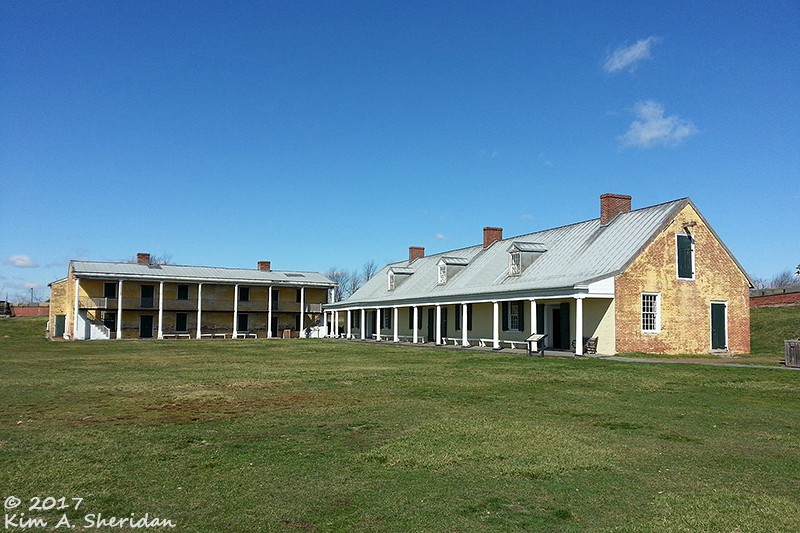 It was COLD this day at Fort Mifflin. And very windy. We took a walk along the outer seawall, and Don was almost blown into the Delaware River. After a winter in which we’d had only two light snowfalls, a true winter storm was a rude awakening. 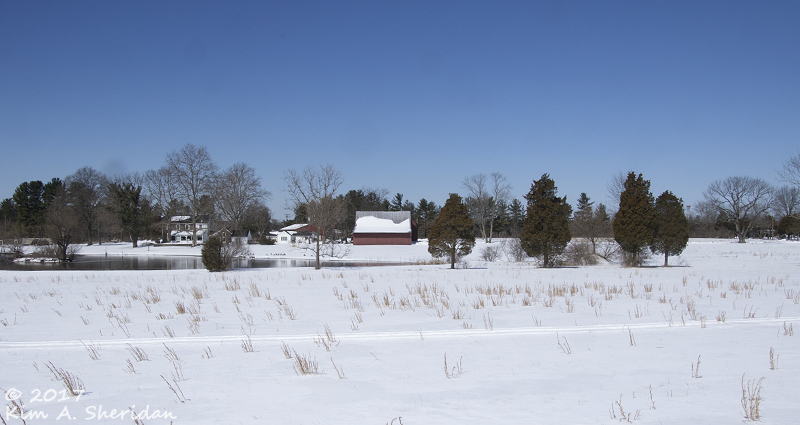 Snow and sleet, frozen hard overnight, left an impenetrable layer 6” deep, even deeper to the north. 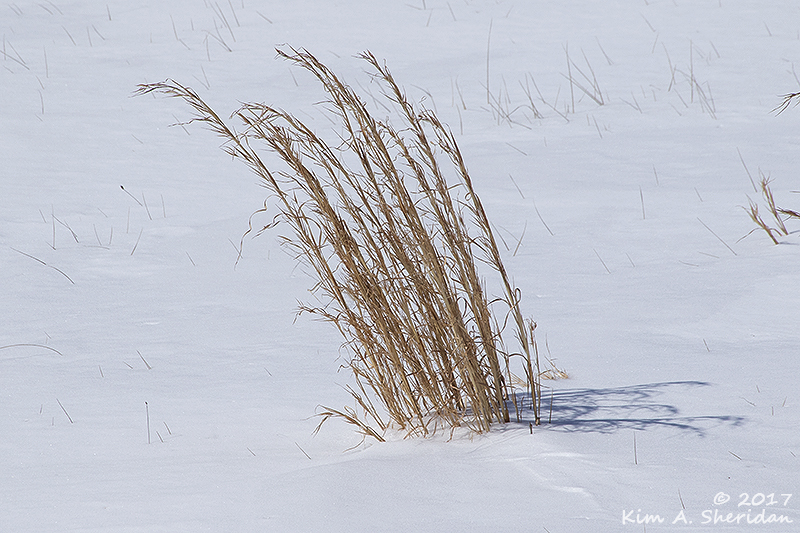 When the roads cleared, I went in search of interesting snow photographs. With a real camera. 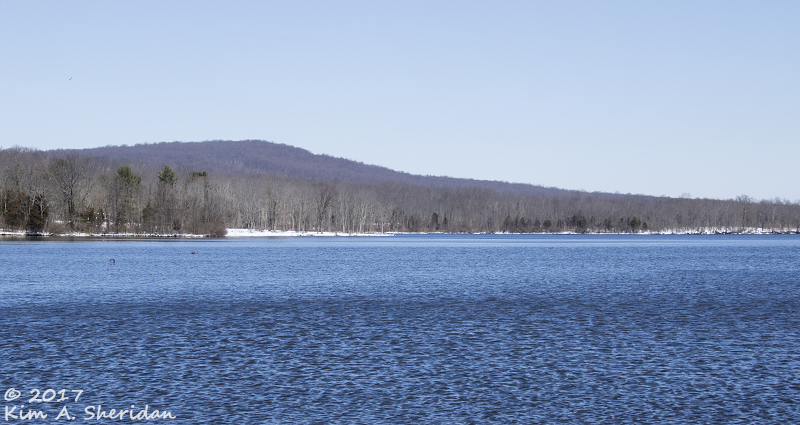 Lake Nockamixon and Haycock Mountain, in Bucks County. 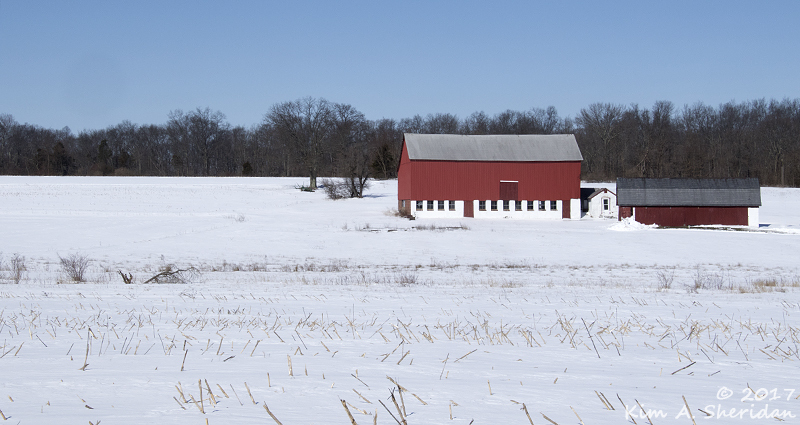 Mostly I was looking for red barns. Found one! 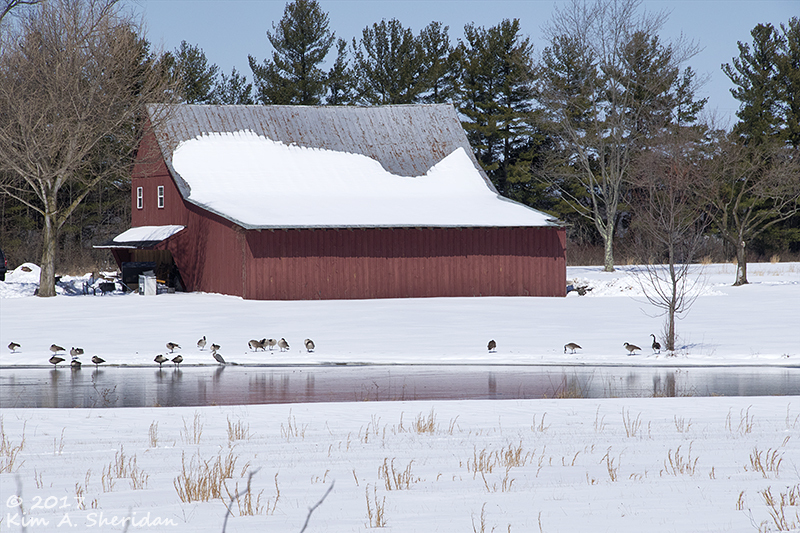 This one came with a lovely farm pond, flanked by Canada Geese, and, as I learned later, a Great Blue Heron. 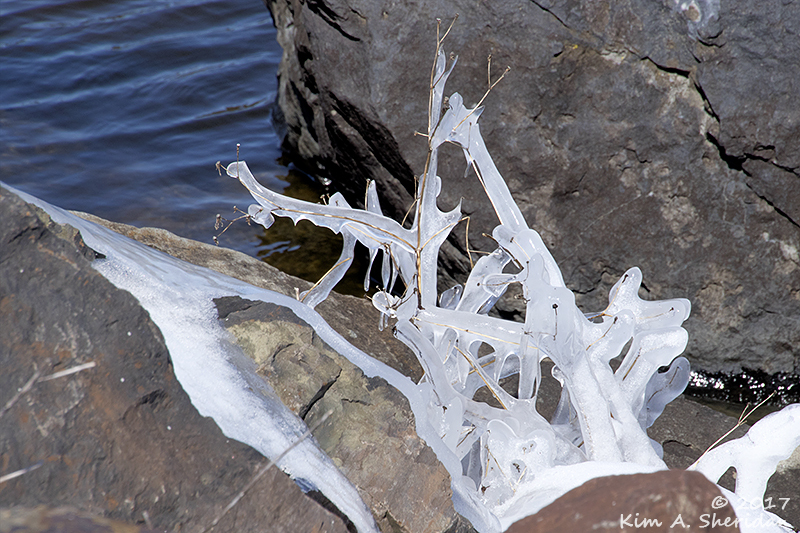 Back at the lake I found some of the plants encased in ice. The snow and ice got me thinking about those wood frogs. 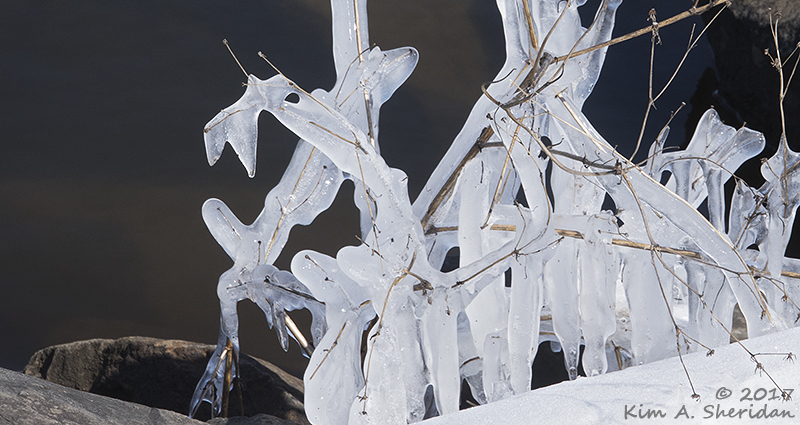 Wood frogs can survive freezing. But on the warm days they laid thousands of eggs. The frogspawn was still there on my last visit, masses of strings of dark-centered gelatinous spheres. Will they survive? Will there be tadpoles? Or will the madness of winter following spring be the downfall of this new generation of frogs? 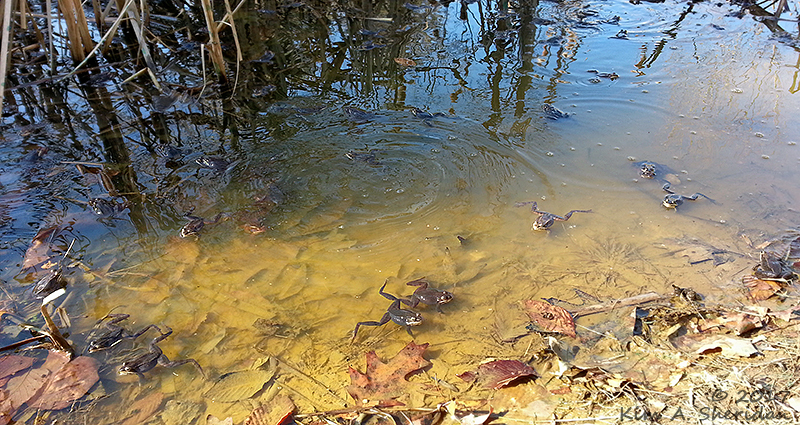 This topsy-turvy winter may not have been beneficial to the frogs. It certainly hasn’t been beneficial to my photography. I feel as if am simply killing time, enduring an endless maddening wait for something just over the horizon, like frogs waiting for a warm spring day. Waiting can have its own benefits. The lessons I’ve learned from this period of my life? Never take good eyesight for granted. Don’t sit in the house and mope; time in nature heals the restless soul. Don’t overlook the wonders that abound at even the most familiar places. And don’t leave the camera at home!